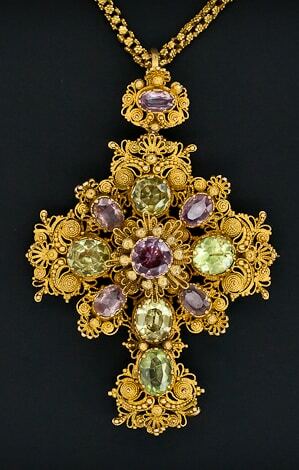 Pink Topaz & Chrysoberyl Cannetille Gold Cross c.1830. Cannetille is a close relative of filigree work. It typically features fine gold wires or thinly hammered sheets. Jewelry with cannetille was very popular in the 1820’s and 1830’s. Motifs included tendrils, scrolls, coils, beehives and spider-like rosette ornaments. Jewelry featuring cannetille was often embellished with granulation and thinly stamped metals. In the early days of cannetille, stamped metals were typically disk-shaped; floral and shell motifs later became popular. Colorful gemstones tend to embellish the pieces: Brazilian aquamarine, pink topaz, amethyst, and chrysoberyl. In central Europe, jewelers also used garnets (from Turnau, Czech Republic), turquoise and opals. In England, rubies were not uncommon. 1 Most of these stones were relatively inexpensive, at least compared to diamonds, and this fitted the trend of creating jewelry at a minimum expense. Usually, the stones were set in closed backs and foiled at the back to create a more uniform hue. Very unusual pieces have open settings and pieces set with diamonds and enamel. Cannetille work was inspired by embroidery, reputedly the embroidery found in traditional peasant garments. Some sources mention 18th century Portugal or India as a source, some mention France. The simple filigree tendrils that started to appear in the fashion and jewelry world around 1820 transformed into cannetille during the following decade. One can find cannetille work from almost every European nation during the 1820’s and 1830’s. On one hand, the rise of cannetille is explained by the “gold poverty” of the early nineteenth century. After the Napoleonic wars, precious metals were extremely scarce on the European continent. The economy was crippled in the early 1800’s and even the upper classes struggled to survive the depression. Nonetheless, grand jewelry was in fashion. Cannetille jewels could be very large, but used only a small amount of gold. Though they were typically quite labor intensive (goldsmiths fabricated the intricate wire work completely by hand), the jewels were kept affordable by low labor costs. 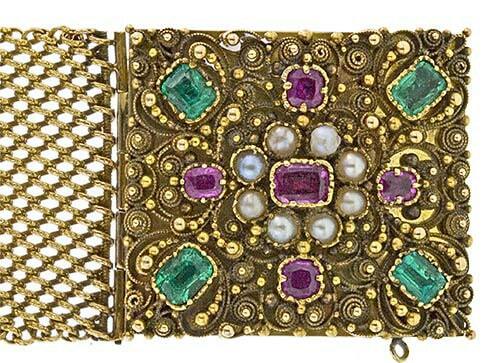 Cannetille Bracelet Clasp c. 1830. On the other hand, cannetille jewelry tapped into a particular aesthetic urge– part nostalgic, part romantic– running through Europe at the time. In France, as the Bourbon monarchs returned to the throne in 1814, jewelry from pre-revolutionary days, in particular, the Louis XVI style worn by Marie Antoinette, became fashionable again. In Germany, scions of the literature and arts like Goethe and Novalis celebrated nature and the infinite, nodding to a distant, more authentic past. With its strong connection to the traditional garb worn by women in rural areas, cannetille fit nicely with this new aesthetic mood. It is likely that city dwellers were exposed to such garments during their jaunts to country feast days. As suddenly as cannetille work emerged in jewelry fashion, it disappeared. The height of cannetille jewelry in civil fashion is around 1830 and when no other clues are present to properly date these pieces – as hallmarks, invoices or other provenance – they are dated as ca. 1830. In Moscow’s Hermitage, there is a silver toilet service from the collection of Catherine the Great which was made around 1740-1750 in China (possibly from Canton). Although it mainly features filigree work, the piece shows early signs of cannetille decorations. In particular, it features a delicate spider-web “over stitching” around a small stamped circular dome, a design which would became popular later in the 19th century. Thread cannetille – The main body of the jewel is created from very fine gold threads of high alloy on which other ornaments were soldered. These pieces are very lightweight. Plate cannetile – Instead of creating a framework of threads, the main body is made from a very thin plate which was, usually, worked open (à jour) on which the ornaments were soldered. This was used especially for larger jewelry objects. Cannetille is different from filigree in the way that the ornaments in the former are 3-dimensional (such a twisted coils or springs) with some repousse work while the filigree work is primarily flat. The overall body of filigree work may be enclosing a space, yet the ornaments themselves (like tendrils) are 2-dimensional. Very convincing replicas of cannetille work (from ca. 1830) are fabricated in Turkey and probably in the UK as well. These can fool even some of the best of jewelry experts in the field, especially when they have been worn for several years (giving them some wear and tear “life”.2 The peasant cannetille variety is also still produced today, but mainly to serve an audience who uses them still in folklore tradition and are usually fully disclosed as newly made. Thanks go out to the people of the Textile Museum, Tilburg, The Netherlands for providing an endless stream of books; Piet Minderhout and Klaas Akkerman for providing valuable additional information.